Currently on view at the New Museum, The Generational: Younger than Jesus features the artwork of 50 international artists younger then 33. The exhibition will be up until July 5th, and being that it makes such a powerful statement not only by referencing the age Christ was crucified but also enstates the power to lump an entire generation into one space. I recommend seeing the it before it comes down. The curators have pulled together various artists who appear to be angst driven and fall within the category of being between the “X” and “Y” generation (“X” being closer to 33). I saw the exhibition a few weeks ago and have taken my time to write and post the photos I took (with my iPhone) because the art which is thrust upon us is quite a lot to swallow. 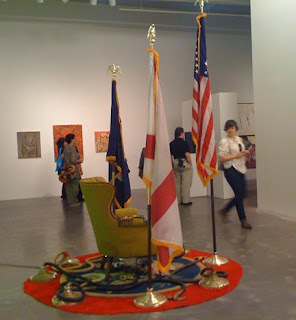 Note: I started this post June 27th and have finished, and posted today, July 3rd, 2009. Being that these artists are actually my peer group, I had a certain level of expectation that arose before even entering the space. Working my way from top to bottom (as I tend to do at the New Museum), I found myself smiling on the 5th floor and grinning on the way down, but disappointed by the 4th floor. The 2nd floor according to my opinion, is the most cohesive in its relational scope of a generation. 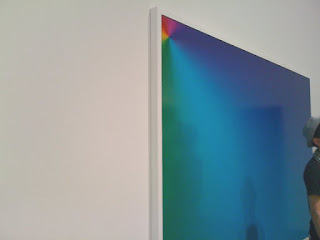 All of the photos that I’ve posted here are from the 2nd floor, and vary from “living sculpture” (Live model, bed, and sleeping pill) to a large digitized colorfield by Cory Archangel, seen below. Visually this floor made the most sense to me and I found personal inspiration in a few of the works. I am currently working on my final thesis project at N.Y.U. and the evolution of my paintings (both watercolor and acrylic) are finding themselves as a composed, cohesive thought on the wall and tilting out as object. The collage of last year, has now found itself separated and instead of confined within the frames of a piece of paper or canvas now is housed variably on the wall. My personal favorite was the piece shown above by an artist whose name sadly, I forget. Clothes and other personal items were purchased from individuals in Japan. 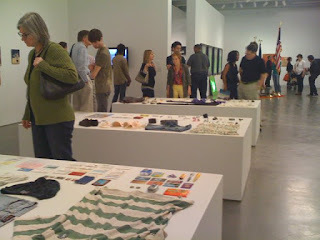 The items are on display on various platformed surfaces. I enjoy the idea of the artist finding “art” in the private pockets of others and the piece is surrounded by loosely painted oil paintings of men and wrestlers by yet another. 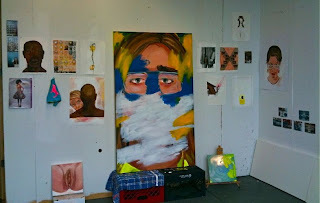 Now since I am also an artist currently “Younger than Jesus” I’ve decided to add my current studio installation view into the mix. 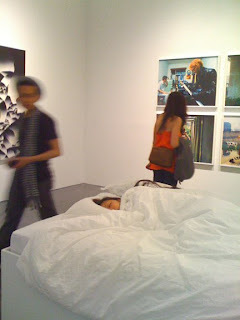 Because while my work has been yet to be included at the New Museum (hint hint) I do have the power as the curator of my blog to enter my work, even if via cyberspace, into the show. 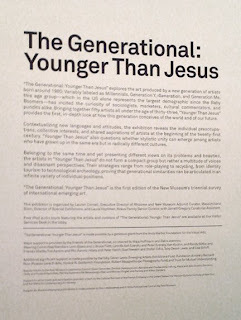 The Generational: Younger Than Jesus was organized by Lauren Cornell, Director of Rhizome and New Museum Adjunct Curator; Massimiliano Gioni, Director of Special Exhibitions; and Laura Hoptman, Kraus Family Senior Curator. My work will be on-view at NYU’s 80 Washington Square along with the rest of the M.A. graduating class of 2009, Tuesday, July 28th. Artists: Jill Blankespoor, Gail S. Flatto, Adene Gold, Katy Alonza Hamer, Edward Holland, Maureen McNamara, Hugh O’Rourke, Ellen Orseck, Jenna Pallio, Julie Phillips, David E. Starke & Teena Spinelli.